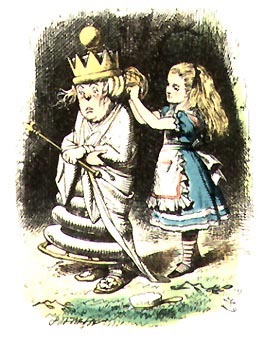 Lewis Carroll, Through the Looking Glass. Perhaps I have gotten a bit rusty at mental arithmetic. 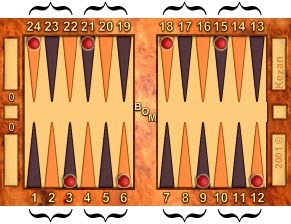 I had difficulty computing a pip count in backgammon, which I found a bit embarrassing. It is a straightforward calculation, but the difficulty was doing it accurately with no pencil and paper while an opponent rattles the dice. The approximate pip count is vital to correct backgammon play: "When ahead in the race, race. When behind in the race, don't race." Sometimes one needs more. The exact pip count is extremely useful to guide one's doubling strategy in some situations. For example, in a race of more than 70 pips, if you are on roll a good rule of thumb is that if you lead by at least than 8% then you probably have a correct double, and if your lead is at most 12% then your opponent probably has a correct take. It arises in many other situations as well. Since the pip count is important, there have been a wide variety of methods developed to compute it over the board. See Mark Driver's article, "A Beginner's Guide to Counting Pips" for one method and references to more. 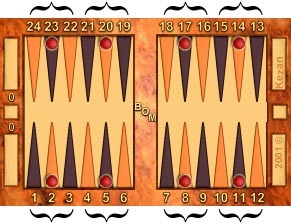 There is some related discussion in the Pip Counting section of the rec.games.backgammon archive. As a kid, I did well on math competitions not by brute force computation, but by a compilation of techniques. I would try to recognize the easiest method for doing a problem. Sometimes this would involve doing a different computation than normal just because it would require less memory for intermediate results. In the following, I'll outline a method I use for doing pip counts which requires less mental arithmetic and mental rearranging of checkers than any other I have encountered. One doesn't even have to remember the numbers of the points! It mainly involves counting, though it also uses adding 2-digit numbers to 75 and multiplying 2-digit numbers by 3. As an added benefit, along the way one gets an approximate pip count, which usually suffices. I call this the half-crossover method. Step 1: Count the half-crossovers to bear in. Counting crossovers is easy, but not refined enough for a good approximate pip count. 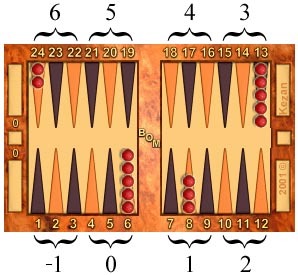 Instead, think of breaking each of the outer and inner boards in half, into triples: The first triple is 1-2-3, the next is 4-5-6, the third is 7-8-9, and the last is 22-23-24. Let's assume that, rather than bearing off, your goal is to bear in. You want to bring your checkers to the 4-5-6 triple. Any checkers in the 4-5-6 triple get counted 0. The checkers in the 7-8-9 triple would have to move forward one half-crossover. Those in the 10-11-12 triple have to move forward 2, those in the 19-20-21 triple would have to move forward 5, and those in the 1-2-3 triple would have to move backward 1. For example, from the starting position, you have 5 checkers already there, 3 checkers that need to move forward 1 (subtotal 3), 5 checkers that need to move forward 3 half-crossovers (3 + 15 = 18), and 2 checkers that need to move forward 6 half-crossovers (18 + 12 = 30). Step 2: Multiply this by 3, and add 75. If all 15 checkers were on your 5, your pip count would be 15 × 5 = 75. There are 3 extra pips for each half-crossover to bring a checker into the 4-5-6 triple. From the starting position, you have 30 half-crossovers to go, so you add 3 × 30 = 90 to 75 to get 165 as your approximate pip count. Subtract 1 for each checker on the front of its triple. Add 1 for each checker on the back of its triple. What we did in the previous step was to assume that every checker was in the middle of its triple, that every checker in the 4-5-6 triple was actually on the 5. A checker on your 6 is one step further away, so add one for each checker which needs to be pushed forward to the middle of its triple. Similarly, a checker on your 4 is one step closer than we counted, so subtract one for each checker that needs to be pushed back to the center of its triple. These points are the centers of triples, and count 0. These are the backs of triples for red, and count +1. These are the fronts of triples for red, and count −1. In the starting position, you have 5 checkers on your 6 that need to be pushed forward minus 5 checkers on your 13 that need to be pushed back plus 2 checkers on your 24 that need to be pushed forward. 5 − 5 + 2 = 2, so one needs to adjust the approximation computed in Step 2 by adding 2: 165 + 2 = 167, the exact pip count. Feel free to cancel +1's and −1's that you can pair up. Since the 6 point and midpoint cancel, the modifications to the approximate pip count are a bit smaller than one would expect by random chance. (Also, it is quite reasonable to count on your fingers. If you keep them under the table other people won't notice.) The net modification (between red and white) is usually less than 5 pips. Rather than Step 1, one could also count the crossovers, then subtract one half for each checker in the front half of its board. One would multiply this number by 6 in Step 2. Rather than (-1 × 2) + (1 × 2) + (2 × 2) + (3 × 3) + (4 × 1) + (6 × 1) one could count (−1, −2), (−1, 0), (1-2, 3-4), (5-6-7, 8-9-10, 11-12-13), (14-15-16-17), (18-19-20-21-22-23) for a total of 23 half-crossovers to bear in. Note that I haven't dealt with checkers on the bar or already borne off. One could easily incorporate them by saying that a checker on the bar needs to be pushed forward 7 half-crossovers (then subtract 1 pip in step 3) and a checker that is off has to be pushed back 2 half-crossovers (then add one pip). One could also just add 20 pips for each checker on the bar and subtract 5 for each one already off. However, usually when one has multiple checkers on the bar the pip count is not as vital, and when one is bearing off one should make the target triple be 1-2-3 rather than 4-5-6, so add 30 pips rather than 75 in step 2, and subtract 2 pips at the end for each checker that is off. For red: 26 HC's to go, for an estimate of 75 + 78 = 153, modified +1, 154. For white: 19 HC's to go, for an estimate of 75 + 57 = 132, modified −1, 131. For red: 11 HC's to go, 75 + 33 = 108, modified +2, 110. For white: 0 HC's to go, 75 + 0 = 75, modified +1, 76. For red: 15 HC's to go, 75 + 45=120, modified −2, 118. For white: 13 HC's to go, 75 + 39 = 114, modified −1, 113. My chamber-music friends will be delighted to know that I have finally learned to count. See also: Other articles by Douglas Zare.